The remaining bacon slices placed side by side. The effect will be that of a large fish sandwich enclosed in bacon. Melt the 1/2 Lb butter and mix with the remaining lemon slices. Lock all the ingredients with the top of the chicken basket cover and place on a grill with fairly hot coals. Close the cover. Turn and baste with lemon butter every 15 minutes until the bacon on the outside is crisp but not burnt. When done, open basket, turn out onto a large tray and slice into serving pieces. 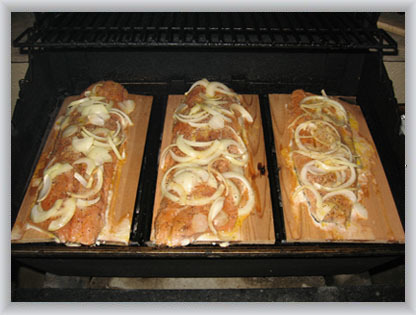 This is a very simple yet delicious recipe on a gas grill which gives either trout or salmon a moist light cedar smoke flavor. Any cedar boards will work, but I would suggest stopping at either Wal-Mart or Gander Mountain to purchase this item which includes four boards cut to size to fit most any grill. Instructions are included but simply soak these boards in water for a couple hours before using them as this will prevent them from burning on the bottom side and will also allow you to reused them again. Place two or three boards on your grill ( as pictured ). Place your trout or salmon fillets skin side down or steak cuts on the cedar boards on low heat only. Add butter, onions, lowery salt, lemon pepper. Let the fish cook until either they turn a flaky white in color or the meat pulls off the skin. You can now take the fillets or steaks right off the skin and serve. Remove all bones from fish. Crumble fish into small flaky pieces. Mix with mayonnaise or salad dressing to a spreading consistency and refrigerate in a closed container. Can be served on crackers or bread. 1/3 of the sliced onions spread with 1/3 of the tomato sauce. On top of the onions place the whole cleaned fish. Inside the cavity of the fish add another 1/3 of the onions and tomato sauce. If a lemon flavor is desired, add sliced lemons to the inside cavity of the fish. Add the remaining ingredients to the top of the fish. 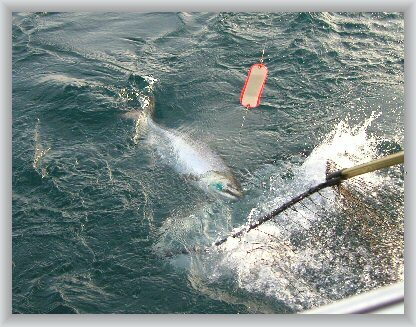 Carefully double wrap the fish with heavy duty aluminum foil, folding in such a way so the juices do not run out. Place the fish over hot coals on a grate and turn every 15 minutes for approximately 1 - 1 1/2 hours depending on the size of the fish. Note: Foil may be pierced with a fork after about 45 minutes to allow excess steam to escape. Also, this method can be used in preparing the fish in the oven, but turning is not necessary. Soak fillets in buttermilk for 30 minutes. Drain and sprinkle with salt and pepper to taste. Dip fish in the pancake flour, Shore Lunch or Golden Dip and fry in preheated shortening oil until brown and tender. Drain on paper towels.